Now that 2018 is coming to an end, here are a few money-saving tax tips you can implement soon that may put more money in your wallet later. Take time to review your portfolio. If you have losses, consider selling them before year-end. Taking a loss offsets capital gains made in your other positions. You can write off or claim your net capital losses up to $3,000, or $1,500 if you’re married and filing separately. And according to IRS.gov, if your net capital loss is more than this limit for that given tax year, you can carry the loss forward to later years. If you received a large refund this past tax year, it may mean your federal income tax withholdings maybe too high. Consider adjusting your withholdings to a level where you get to keep more of your money with each paycheck next year. To calculate your withholdings, visit: www.irs.gov/Individuals/IRS-Withholding-Calculator. This calculator should only be used as a guide. Always consult your tax preparer to confirm your withholdings. Consider giving tax-deductible donations to your favorite charity or place of worship before December 31. You can itemize these donations if the total amount of your deductions surpasses the standard deduction of your filing status. 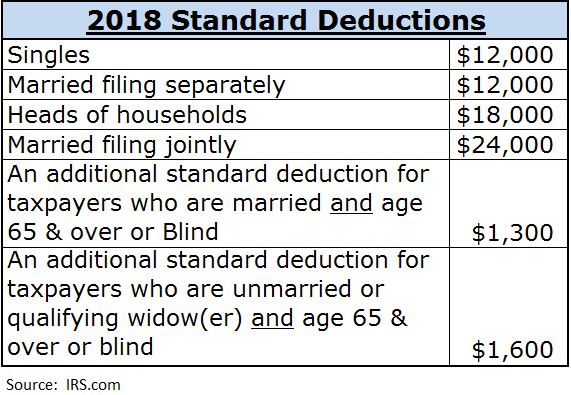 So, if your charitable contributions coupled with your other deductions, like home mortgage interest or real estate taxes, exceed the amounts listed above, consider itemizing for the next tax year. Do you participate in a company-sponsored 401(k) or 403(b)? What about a one-participant 401(k) or a tax-deferred IRA? Contribute to these plans as much as your budget can afford. A 401(k) plan allows you to reduce your taxable income since contributions are deducted from your pay before taxes are withheld. Simply put, it reduces the amount of tax paid out of each of your paychecks. For 2018, the pre-tax contribution limits for 401(k)s, 403(b)s and most 457 plans are $18,500 for individuals who are 49 and under, with an additional catch-up contribution of $6,000 for those 50 and older. For Roth and Traditional IRAs the contribution limit is up to $5,500 for individuals that are 49 and under with an additional catch-up contribution of $1,000 for those that are 50 and older. Pay your January mortgage on or before December 31. By doing so you have one more month of interest to deduct. Please be aware, though, that for the next tax year you will likely only have 11 months of interest payments available to claim. Tip No. 6► Flex It! Do you participate in a flexible spending arrangement (FSA) plan from your employer? If so, you may need to use it before the end of this year. Some employers, who so choose, may offer the following two options to employees participating in their FSA plan. Employers may offer either option, but not both. Option 1: Employers may allow plan participants to carry over up to $500 of unused funds at the end of 2018 into 2019. Option 2: Employers may offer a grace period that allows employees two and a half months after the plan year ends to incur eligible expenses. Please check with your employer’s plan for further details. Would you like to see your tax bill reduced significantly? Then take advantage of tax credits. There are quite a few tax credits available. In some cases, tax credits are more valuable than tax deductions because tax deductions reduce your gross income, while tax credits are deducted from the final amount of tax you owe. For example, if you owe $6,000 and claim a tax credit of $2,000, you end up paying $4,000 … a significant reduction. Credit for the Elderly or Disabled. Excess Social Security and RRTA Tax Withheld. Residential Energy Efficient Property Credit. Low-Income Housing Credit (for Owners). As always, please consult with your tax preparer to answer your tax-related questions.